Hi Everyone, Thanks for joining us last week I hope you enjoyed last week's challenge of Blue, we all loved visiting your blogs and seeing your beautiful creations! On to this weeks theme and we've chosen 'Trees and Leaves' it's entirely up to you what you create. Perhaps try using some trees or leaves stamps, have lots of fun creating the many wonderful colours of leaves. The design team have made some really beautiful cards, a fatbook page & Gothic Arch as inspiration for you. Their work is displayed below. Congratulations to Cathy. 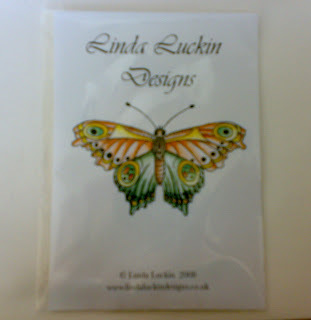 You have won last weeks prize - A butterfly stamp by Linda Luckins' Please email us at mytimetocraftchallenge@hotmail.co.uk and we will get your prize sorted out and in the post for you. 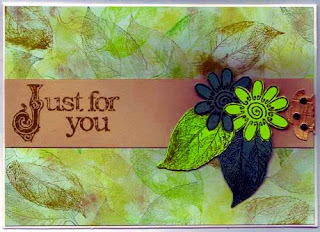 For my card I decided to concentrate on 'leaves' using a Stampin 'Up set of stamps. I have stamped the background using various Autumn shades of dye ink, working from light to dark and overlapping the images. I have then stamped leaves and flowers onto co-ordinated Bazill card stock, cutting them out and mounting 3D. I inked my arch with various Distress Inks, then stamped and embossed a large tree. 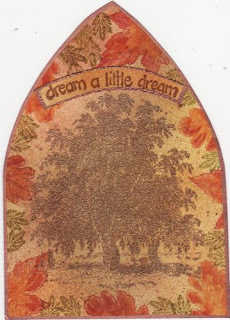 I stamped leaves round the edges and water coloured them with Distress Inks and stamped a phrase which I embossed and edged with Copper Krylon and also the edge of the arch too. I coloured Tilda, the tree stump and leaves with Pro Markers and m atted these onto Papermania papers to create my Fat Page. I stamped the leaves with vintage sepia versafine and then stamped the tw ig tree one of Linda Luckin's designs with the same ink pad. I distressed the edges of the tree paper and inked them. I then added ribbon an d a word tag. I used the threading water punch on the top and bottom edge of the striped paper and mounted this onto the white base card. I cut a strip of co-ordinating paper and placed this across the centre. I cut a scalloped circle of text paper, then cut out the round snowflakes from some patterned paper and glued to the base. Using the Cuttlebug cut and emboss trees I cut out three trees in co-ordinatin g cardstock, embossed them, sanded them and placed them onto the scalloped circle. Hi everyone! It's time for a new challenge. This week's theme is 'Blue' - Use any shade of blue you like but no other colours are allowed only white! You can make whatever you want using this theme. ATC, card, tag, inchie etc. Congratulations to, Jane Carroll, Mrs Wonka, Marcea, Riley, Floridakat, SammieJay, Bubbles, hilmof, darcy48, and Tracey. You have won last weeks prize - A gorgeous set of Moody Muad Downloads! 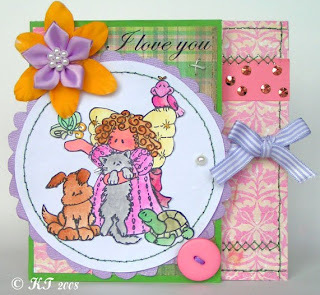 This week's Prize, supplied by Linda Luckin Designs - is this beautiful 'Butterfly Stamp!' everyone who takes part in this week's challenge by (10pm Monday the 29th of September GMT) will be entered into a prize draw and 1 lucky persons name will be picked at random winning this stamp! 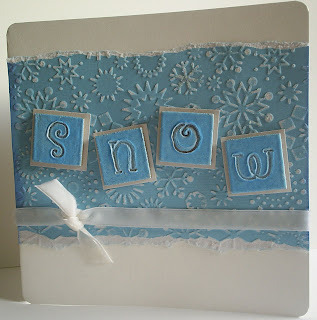 The background is embossed with snowflakes, then sanded and mounted onto the base card. The frame is stamped and embossed then cut out, two pieces of ribbon and a punched snowflake are attached before being mounted onto 3D foam pads. 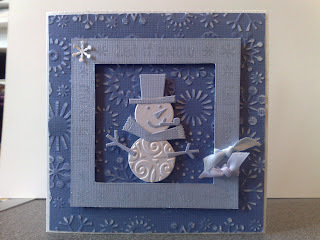 The snowman is die cut in white pearl and blue card then mounted onto the card with 3D foam pads. I started with my square of blue card then I stamped Lindas little fish with blue stazon! I triple embossed it and added some acrylic gems. 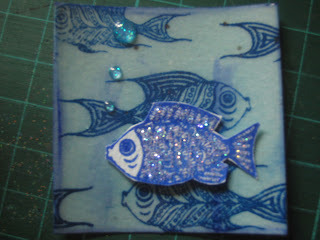 Then I stamped another little fish and added dazzling diamond from stampin' up to his scales. I covered my card with patterned paper, and stamped a Cuddly Buddly image and water coloured her in. I stamped a message and put it in the middle of a flower and added a birthday greeting and more flowers down the side of the card. 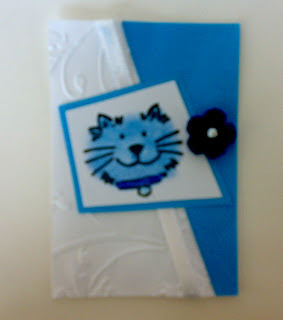 I made my atc using a cat stamp coloured with chalks. 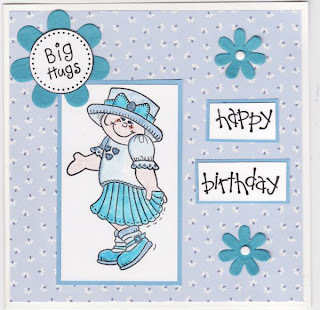 I used blue paper and white paper - embossed with my cuttlebug and finshed off with a white ribbon and blue flower! For this challenge I am sharing a funky Christmas Card made using the Dot & Stripe Christmas set designed by Sheila Oliver for Tanda Stamps. I have paper pieced quite a bit of the card and embellished with satin ribbon and a clip. This weeks challenge is postponed until next week. Challenge 29: Bright and bold! Hi everyone! Thankyou for taking part last week, we all loved seeing your creations. This week's theme is 'Bright and Bold' You can make whatever you want using this theme. 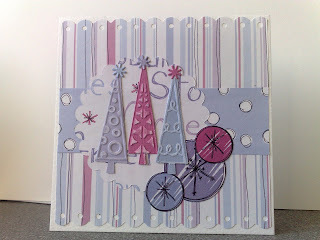 Congratulations to, Sue You have won last weeks prize - a set of Tanda stamps. Card I stamped my Robbie image from Cuddly Buddly and water coloured him in, and matted him onto the card with bright red and green papers. 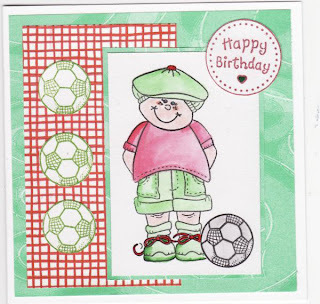 I stamped a Happy Birthday circle greeting in red, and some more footballs in green which I added to the side of my card. I wrapped a wide orange ribbon around a square base card. 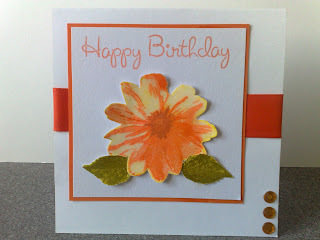 I stamped the 3D Daisy stamp in yellows and oranges and the leaves with shades of green and cut them out. 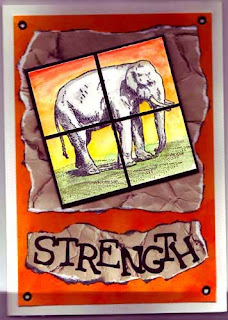 These were shaped and mounted onto a white card with a sentiment stamped at the top, this was mounted onto some orange card and glued to the base card. I covered the daisy and leaves in glossy accents and added 3 orange gems to finish. I started this card with the bright papers and thought I'd keep it simple and let the colours do the talking! 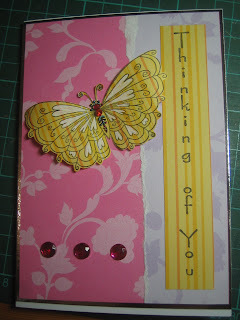 I then stamped the butterfly image with black stazon and the thinking of you. I coloured in the hearts on the butterfly with white gel pen and gave him a bright bindi body. It was all finished with three big pink gems. 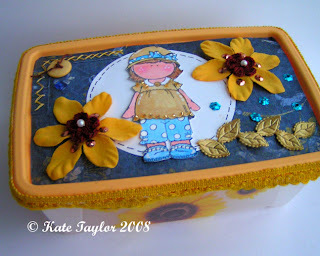 I decorated my box with K & co papers. and watercoloured a hanglar image. I addded some freehand stitching, embellishments and lace around the edges. I've made the background piece by sponging inks onto a piece of white card and randomly stamping all over the piece with the 'I do like to be beside the seaside' word stamp from Rubbadubbadoo. 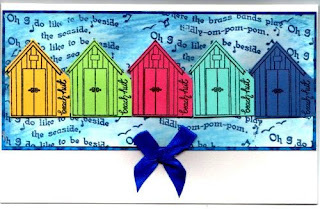 The beach huts, also from Rubbadubbadoo have been stamped onto various bright coloured card stock, cut out and mounted with 3D foam pads over the background. Embellished with a satin bow. tamped my image and coloured her with Pro Markers and then matted her onto butterfly patterned backing paper. 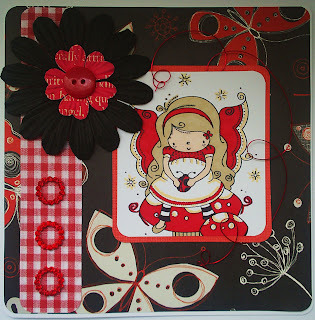 I added a strip of gingham paper, a flower, some gems and some red craft wire. Hi everyone! I hope you're all having a great Summer, It's time for another challenge! This week's theme is 'Animal Antics'. Perhaps try using animal rubber stamps, animal photos or pictures. Interpret our theme in anyway you want! Our design team have made some great ideas for you. Happy crafting!! My card is made using a Rubbadubbadoo image. 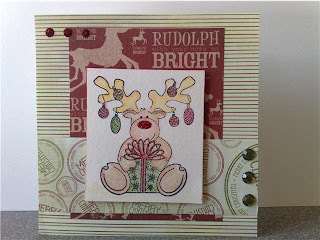 I have used a tried and tested design, this time stamping the image onto Stampbord and colouring with inks. I have chosen backing paper that reminds me of the Elephant's hide. The word stamp is also from Rubbadubbadoo. Embellished with eyelets. I stamped various stamps from my Stampendous Changito The Monkey stamps with Versafine inks and watercoloured them in with my Adirondack Ink Pads. I matted the main image onto a plain white card and stamped the small leaf stamp all round the edges and painted them in too. 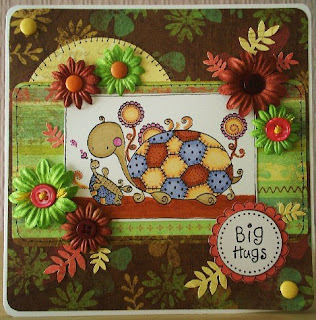 How I made it... "I stamped my tortoises and coloured them with Pro Markers. I matted them onto K & Co papers and added some doodling, flowers with stitched buttons and some punched leaves. 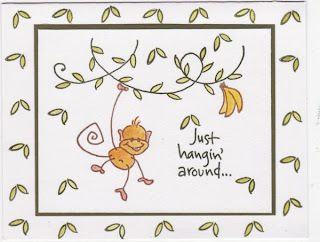 I finally added a sentiment from Cuddly Buddly. 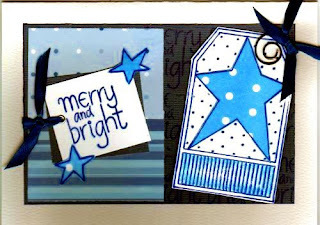 I made my card using this gorgeous stamp by High hopes, I coloured it with watercolour pencils. I cut a circle shape and freehand scallop frame and edged with freehand stitching. I added a flower, a making memories rub on, button and some sequins and lots of freehand stitching. My card opens up by untying the ribbon.